Risottos are so creamy and delicious. I have never minded standing at the stove and stirring and stirring anything that tastes so good, like a roux, a custard, a risotto. You know they require patience and constant attention. 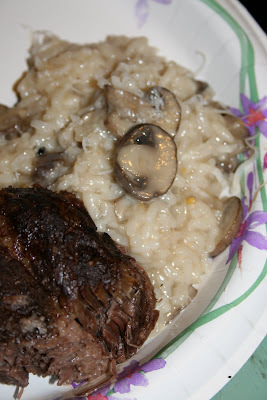 But, in the case of this risotto, you can make it in only seven minutes, and even better, your attention can be given to whatever you are serving with the risotto. It happily prepares itself and the results are amazing. Hope you like this one. In pressure cooker, simmer chopped onions in hot olive oil and butter for three minutes, stirring often. Do not brown. 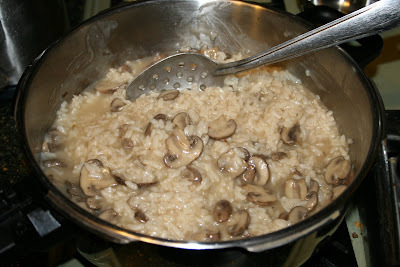 Add mushrooms and Arborio rice and stir constantly for additional minute. Add broth and wine; stir. Close lid and bring up to high pressure and cook for 7 minutes. Release pressure using cold-water release. Stir thoroughly, adding in grated Parmesan cheese and salt and pepper. 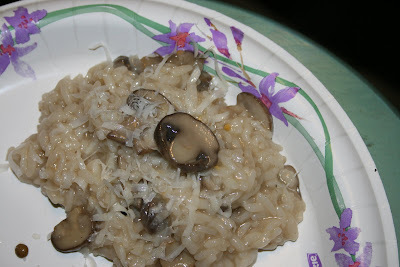 Nice recipe -- certainly takes a lot of the time and labor out of risotto. I think the one thing I would tweak is to reduce the cook time under pressure. Mine came out a bit too overdone.